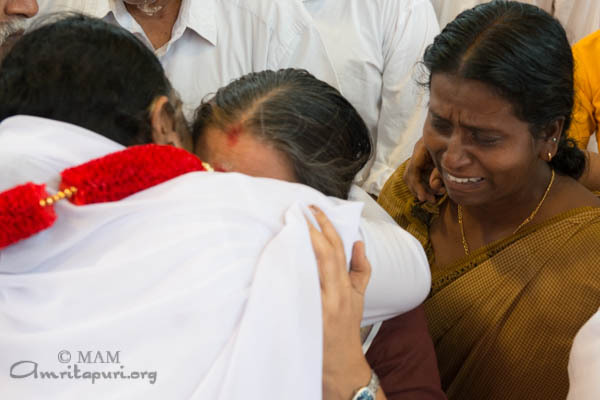 Following her departure from Kochi, Amma visited eight houses on her way to Trissur, spending time with each family, before arriving finally at the destination of her next program at around 8:30pm in the evening. 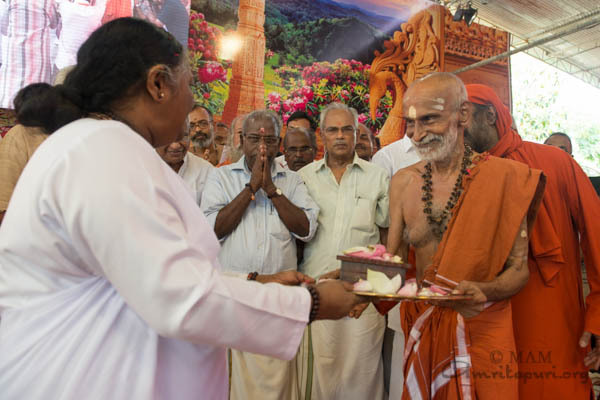 Amma was formally welcomed to Trissur by the head priest of Guruvayoor* temple Chennas Dineshan Nambootirippad. 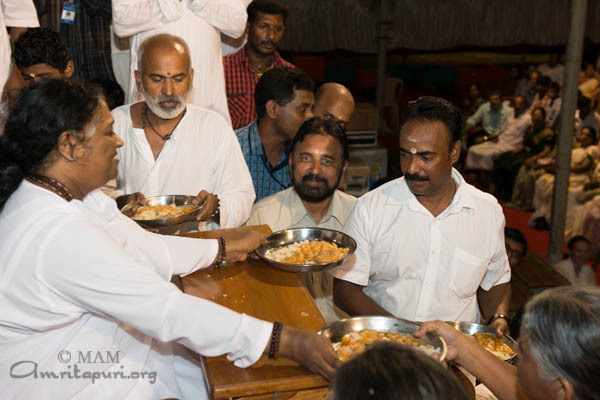 Immediately afterwards, Amma proceeded to the stage where she sang two bhajans and, to the delight of the large crowd of devotee volunteers, served a prasad dinner to one and all. “Working for the welfare of the society is the goal of people like us. This is what Jesus Christ has taught us; therefore we care for others. 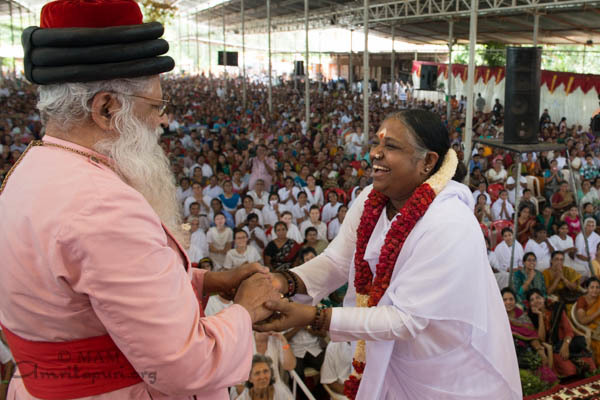 By imbibing the message of God and serving others, Mata Amritanandamayi Devi has been blessed by God. 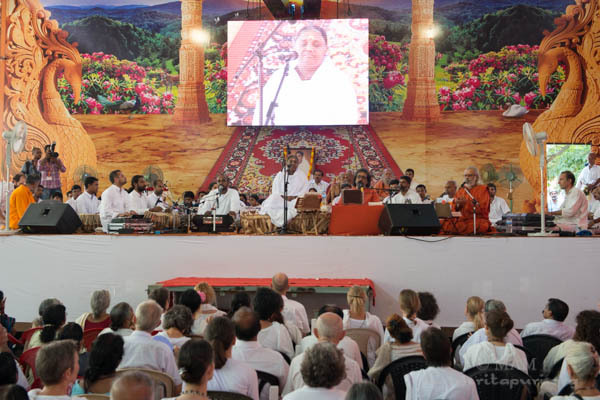 Amma’s message of peace has travelled all around the world. Where there are problems and difficulties, we should bring peace – this is God’s desire. 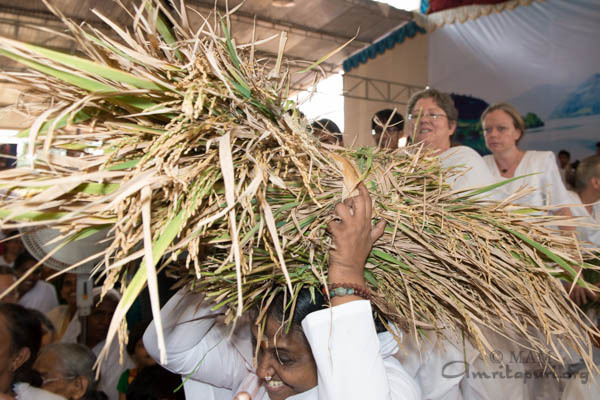 Amma is a great person who is working day and night in order to bring God’s desire into fruition. 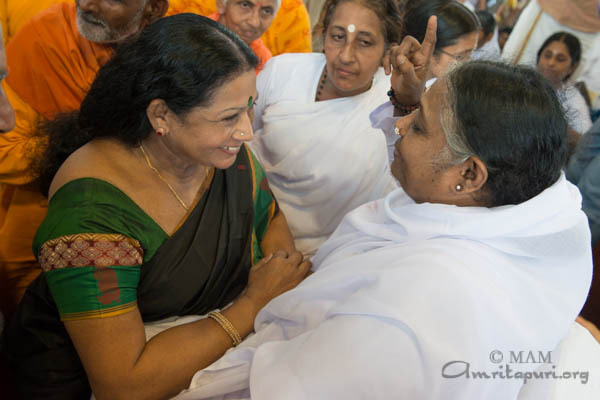 “I have read one of Amma’s books – her language is so simple. Through her words – even though she has not studied at Oxford or Cambridge – she is conveying the message of goodness to society. She has imbibed God’s message and is giving goodness to humanity. I’ve gleaned this through reading her words and listening to her talks. 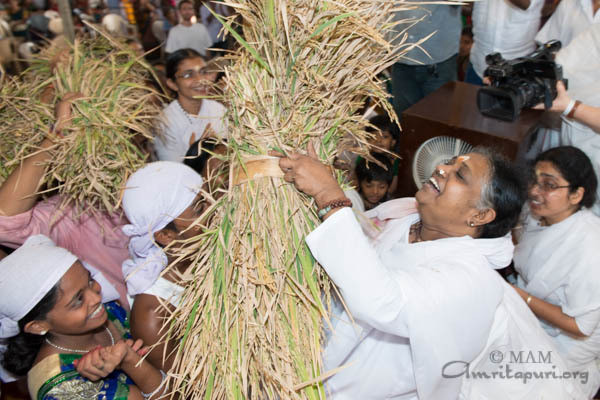 I’ve gained my knowledge from studying at universities, but Amma’s education has been different – she has learned directly from God through serving others. 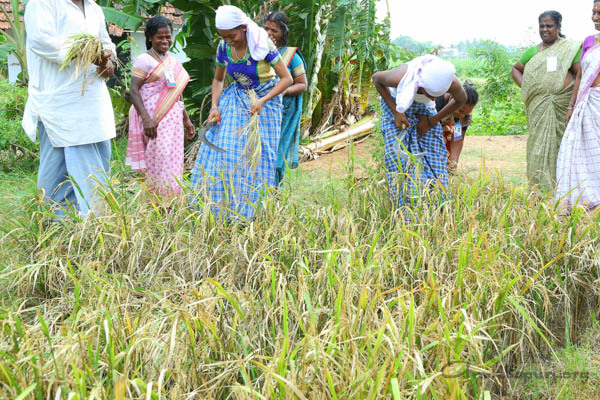 Inspired by Amma’s message of living in harmony with nature, a group of 10th standard students from the Amrita Vidyalayam, Trissur had been growing crops locally using organic farming methods. They had recently cultivated organic rice on a small plot of land near to the school. 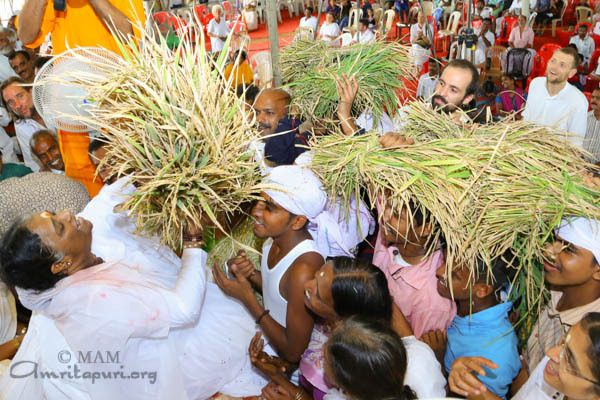 Hari Krishnan, Adarsh, Rohit, Siddarth, Jaya Sudha, Arjun, Sri Lakshmi and Partha Sarathi presented Amma with the harvest during darshan. It took them 110 days to grow and harvest the rice using traditional methods that they had learned from local farmers. 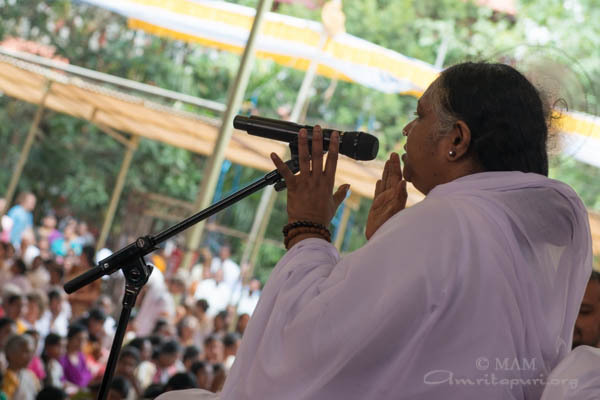 On both program days, Amma sang bhajans and gave satsang, before giving darshan to all those present. Despite the oppressive heat of day the crowds were large and darshan continued late into the night and into the early hours of the next day. 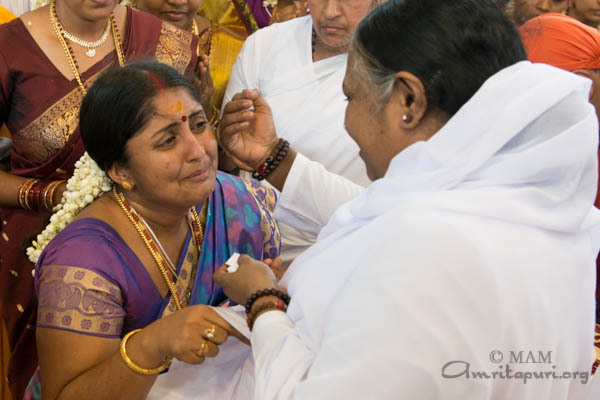 Each evening brought relief with a cool rain, calling to mind the refreshing breeze of inner peace that so many experience in Amma’s presence. 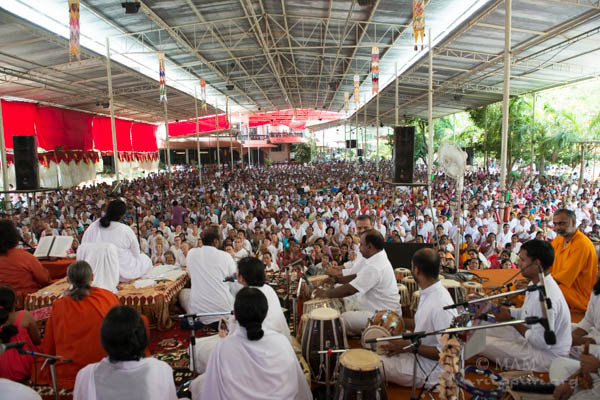 Despite soaring temperatures, many thousands turned out for Amma’s two-day Brahmasthanam Festival at Kochi. 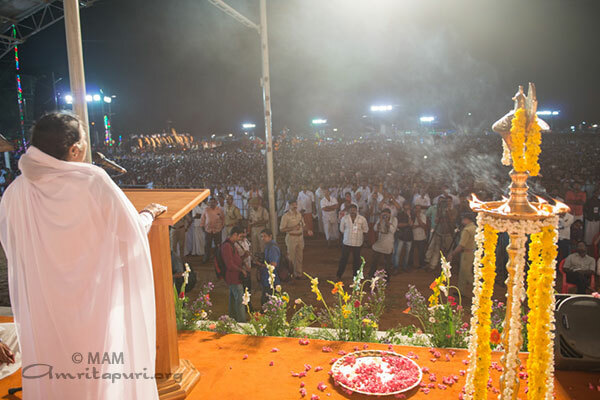 Amma gave talks on both days, led bhajans and then gave darshan throughout the day and deep into the night. 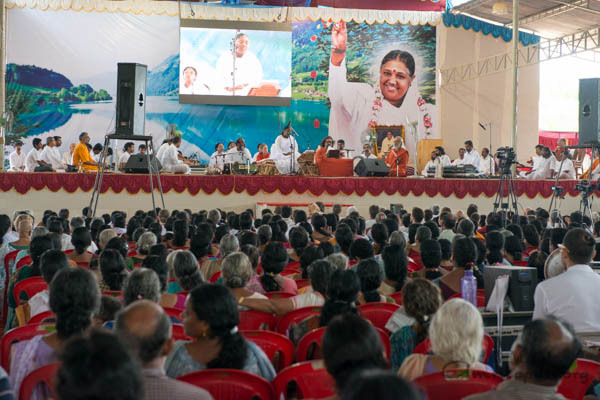 On the second day of the programs, the darshan ended only around 4 in the morning the following day, with Amma having been on the stage for 18 hours continuously. 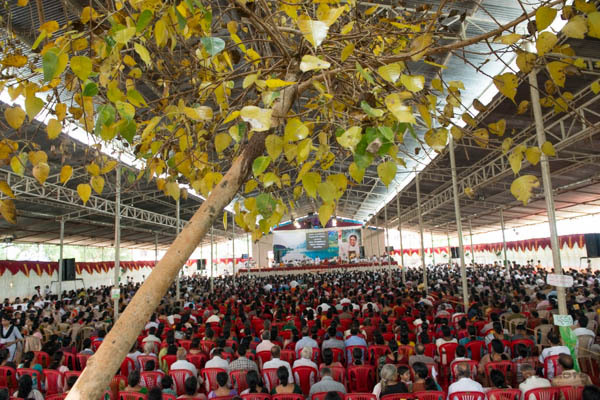 Addressing the assembled crowd in her talk, Amma said that selfless service is the way to God. “The idea of selflessness makes our acts perfect. Humankind will have greater solidarity if we agree to live according to the principles of sharing and caring,” she said. 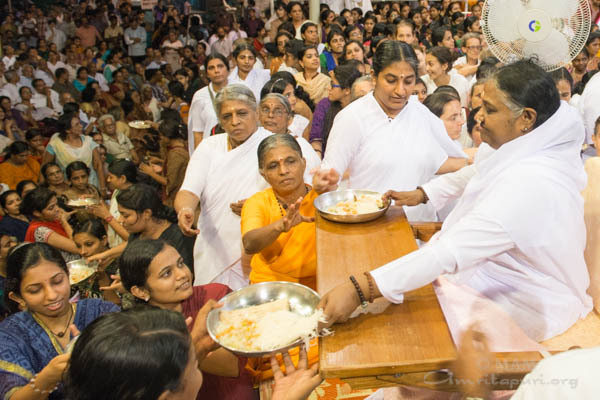 Amma has always said that serving the poor is the true worship of God. 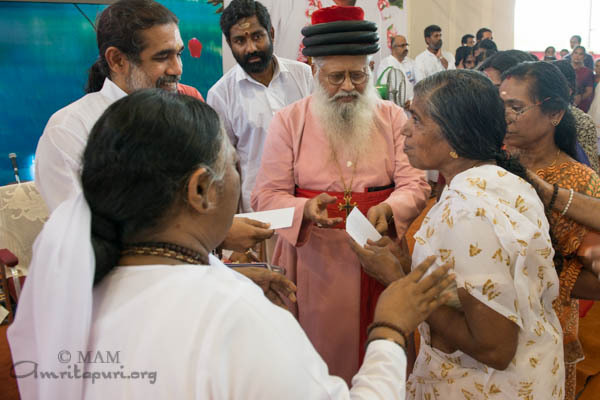 That’s why each of Amma’s spiritual programs marks and expansion of her humanitarian aid projects. 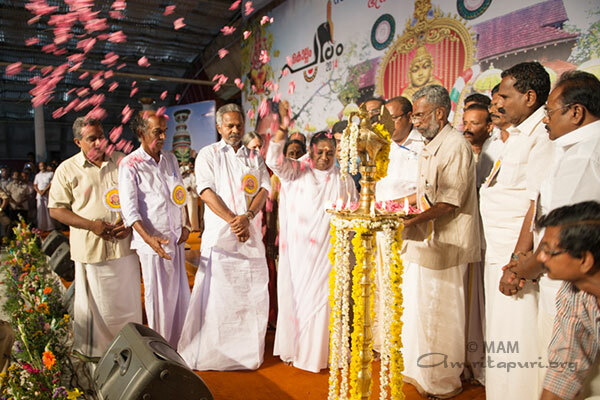 This program was no exception; on the second day of programs, Amma inaugurated a new medical aid initiative. 500 low-income families living in the vicinity of Amrita Hospital have been given free medical cards. These cards guarantee free medical care for all members of the household, benefiting more than 2,500 people. These families will receive both outpatient and inpatient care free of charge. 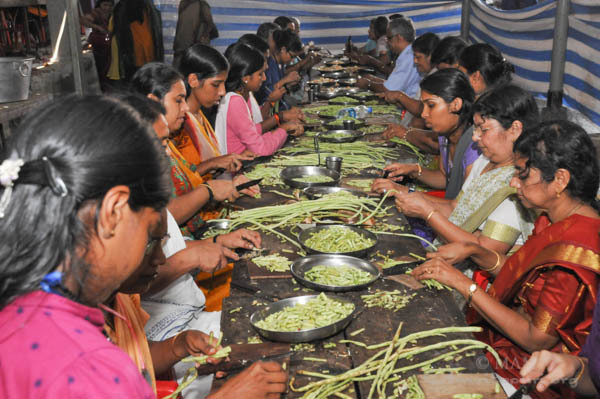 The community of devotees and volunteers in Kochi is particularly service-oriented. A group of Amrita University students recently pooled their pocket money and used it to pay for the digging and installation of a well, providing drinking water for remote village of tribal people in the Wayanad District of Kerala. The students had seen the plight of the people while serving in medical outreach initiatives and decided to do what they could to help them. 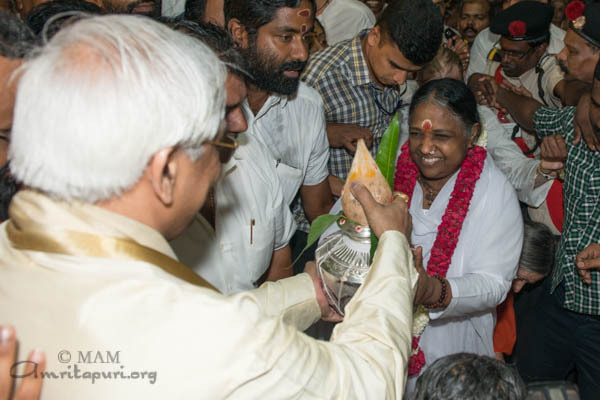 When the students shared this news with Amma, she was moved by their spirit of sacrifice and told them that the Ashram would match their efforts by providing wells to two more villages in the same tribal region. Overall the mood in Kochi was one of celebration, with the devotees and volunteers patiently bearing the heat and the crowds. 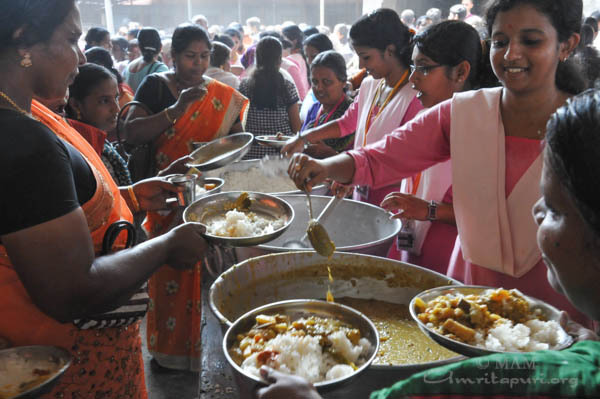 The night she arrived, Amma served prasad dinner to all the local volunteers, who had been working hard to ensure a comfortable and enjoyable experience for all who would attend Amma’s program over the weekend. 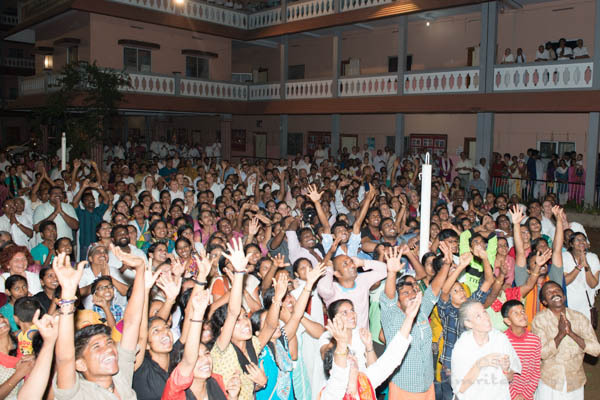 And they would continue to serve throughout the weekend… wherever one looked, one could see volunteers distributing water, erecting shades, putting out more chairs… On both evenings, as Amma left the stage and walked along the balcony overlooking the university campus to her room, the mood was jubilant as the crowd roared with appreciation and delight. 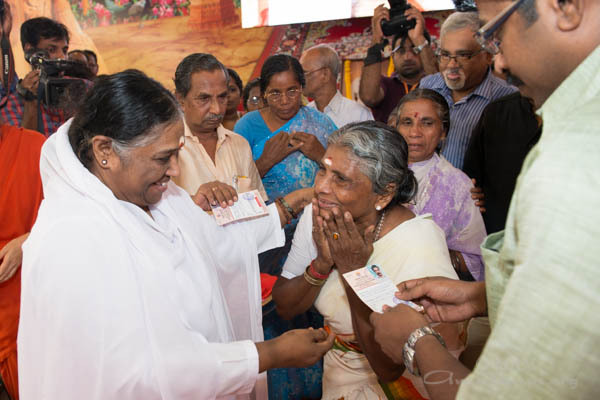 In Kochi as much as anywhere, it is clear that people take the love and inspiration they receive from Amma and use it fuel purposeful lives marked by selflessness, devotion, and values. 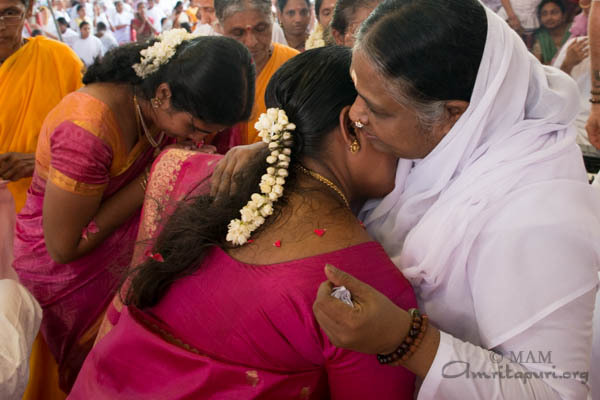 We imagine that nothing pleases Amma more. Amma was presented with the Pandit Karuppan Award at her program in Kochi today. 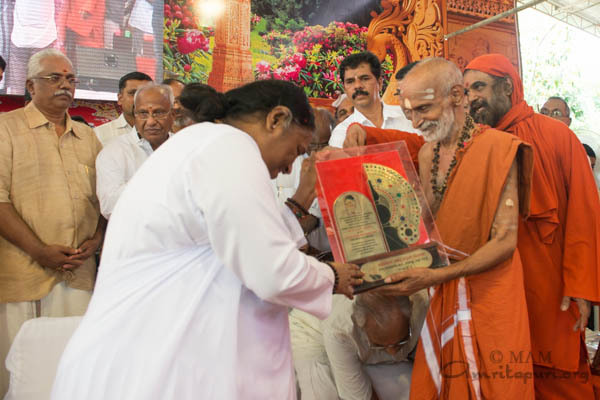 The award was presented by Moopil Swamiyar Shankarananda Brahmananda Bhooti, the spiritual head of the Trissur Brahmaswom Matham, an Ashram in the lineage of Adi Sankaracharya dedicated to the propagation of Vedic knowledge. The award was given to Amma for her dedication, sacrifice and outstanding contributions to society. The award is given by Pandit Karuppan Vichara Vedi, an organization named for Pandit Karuppan, a 20th century poet, Sanskrit scholar and social reformer. Hailing from the fishing community, Karuppan is considered the first human rights activist of his era. He fought successfully on behalf of the so-called untouchables, dedicating his life for their empowerment, education, and protection under the law. It is a tribute to the success of his legacy that the Brahmin community have elected to present an award in his name. 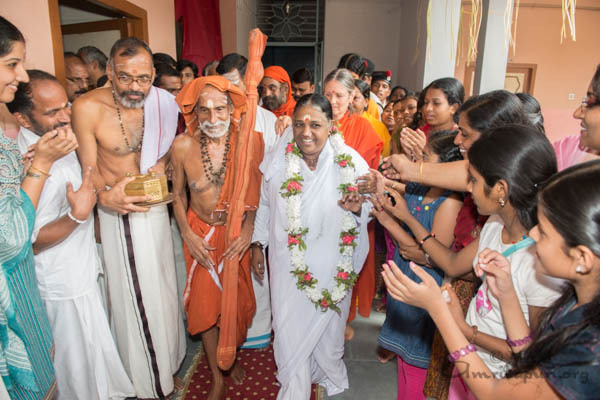 In presenting the award to Amma – herself not belonging to any lineage and hailing from what has been historically viewed as a low caste – the Brahmin community is indicating its acceptance of the principle that divinity is inherent in all human beings, regardless of caste or gender. 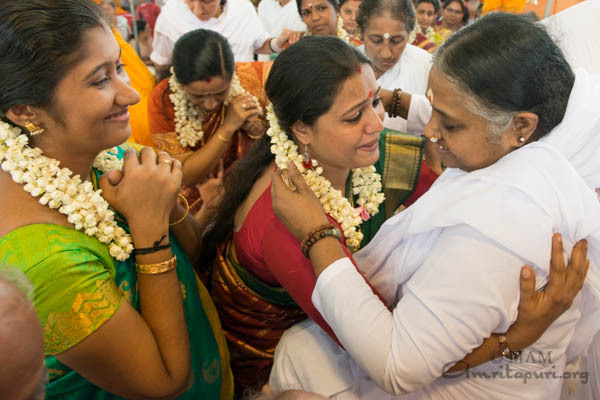 Amma graciously accepted the award, humbly offering it to her children. The award was accompanied by a cash prize, which Amma returned to the Pandit Karuppan Vichara Vedi, asking them to use it to continue their work for society. Official guests who were on hand for the presentation of the award also included Brahmasri Raman Namboodiripad and Brahmasri Narayanan Bhattatiripad, renowned experts in Samaveda and Rig Veda, respectively and the organisers of Pandit Karuppan Vichara Vedi. On this occasion, Amma also blessed the release of a new book on the life and work of Pandit Karuppan. 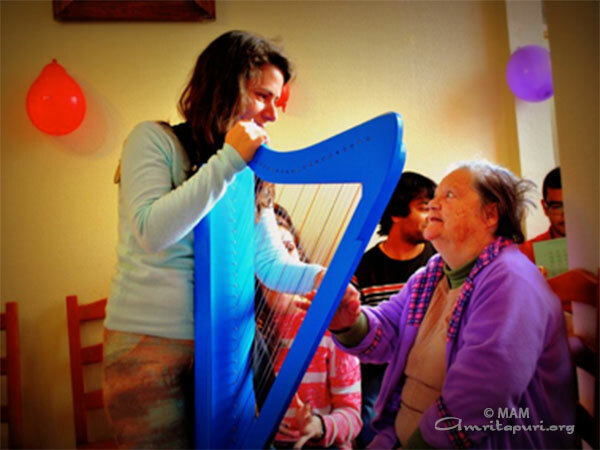 During AYUDH’s 2013 youth summit in Germany “Our World, Our Vision, Our Future,” a group of young people were introduced to playing harp as a means of therapy. At the conclusion of the camp, two youth were awarded a harp with the idea that it would be used by them to play at care-homes in their country throughout the year. This is part of AYUDH’s new “HOPE—Harps of Peace” program, mentored by the world-renowned harpist and founder and director of the International Harp Therapy Program, Christina Tourin. 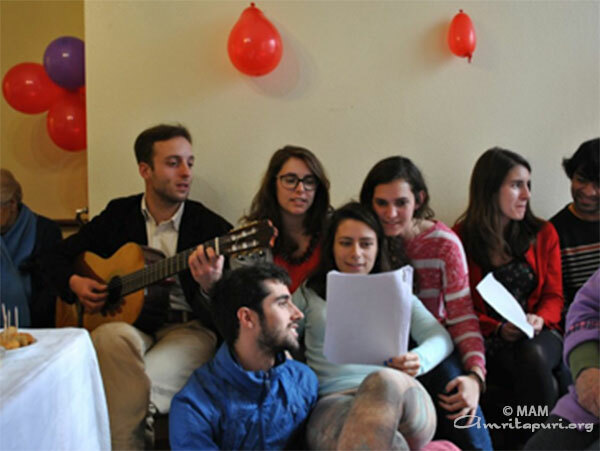 In March 2014, members of AYUDH visited two care-homes for elderly people in the Lisbon area in order to brighten up their day with the soothing harp sounds and their youthful vibrancy. They brought the harp, as well as some other instruments, including a guitar, hang drum. At one nursing home, the group spent time speaking with some elderly ladies, getting to know them and listening to their stories. They visited many bedridden people who often get only one or two visitors a year, playing music, singing and talking. In one house, they were attended the birthday party of a lady who just turned 101. 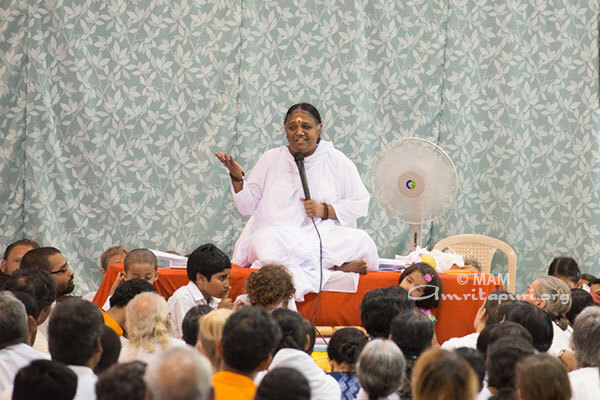 Question: Amma, what is sakshi bhava [witness attitude]? Is it no emotions? No sadness, no happiness? Or is it constant bliss? Once, some time back, I was depressed, and then I didn’t really feel anything. 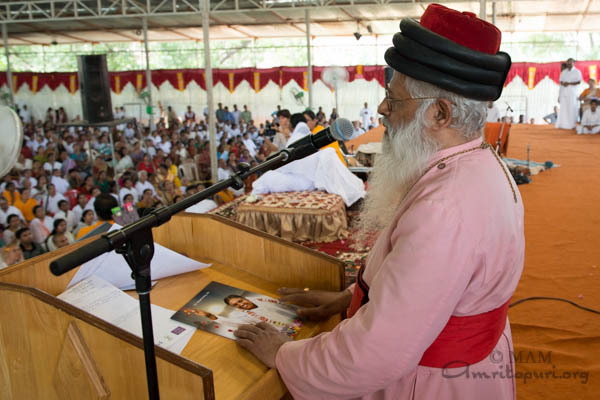 In a way, it was like being a witness, but I don’t think that is meant by sakshi bhava. So, what is it, Amma? Is it that you don’t feel anything, don’t care about anything but, yet, still, somehow feel happy? Amma, could you please explain? 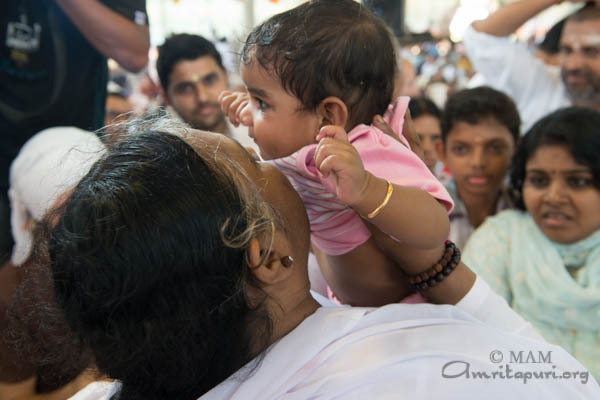 Amma: When you become sugar, then there is nothing but sweetness. Likewise, in true sakshi bhava, there is bliss alone. It’s not that emotions don’t come, they will be there, but you see them, as if from a distance, and they don’t affect you. So, when anger begins rising up in you, you are able to see it very clearly. You witness it and this helps you to remain calm and not translate that emotion into action. Reflecting on the truth that we are not the body or the mind but are the atma [the true self], we can use our viveka [discrimination] to reject that emotion as baseless. Witnessing like this and keeping our distance from our emotions, is for our own safety. Visiting a zoo and seeing the animals in their cages is a blissful experience. But if you open the door the cage and let the animals out their cages it will be disastrous. It is the same with the mind. When you understand the nature of the world and its objects, you will see things and remain detached, like a witness, and accept them. For example, a crow may evacuate upon us, but we don’t get angry at the crow. You just go wash your dress and move forward. Children, in deep sleep, we are in a state of bliss. Sakshi bhava is that same state, yet we are fully awake. In deep sleep, there is no “I,” no “mine.” It’s only when we wake up that all these things come: “my bed,” “my sandals,” “my pen,” “my clothes”… It is when we are overpowered by these “I” and “mine” thoughts that is the source of all discord. In sakshi bhava, you are able to see that this “I” and “mine” have no real substance. Thus, you always remain peaceful. When you understand that there is nothing other than you, there is no scope for disturbance. At present we are totally identified with our individual mind. We need to expand: from the individual mind, to the societal mind, to the mind of the entire universe. You may feel as if you are just a seed, but understand that there is a tree dormant in every seed. Realize that and become the tree. In sakshi bhava, it is not that there are no thoughts or emotions. Just as there are waves in the ocean, there will be thoughts in the mind. But since you know how to swim, you are able to get in the water and blissfully move about them. 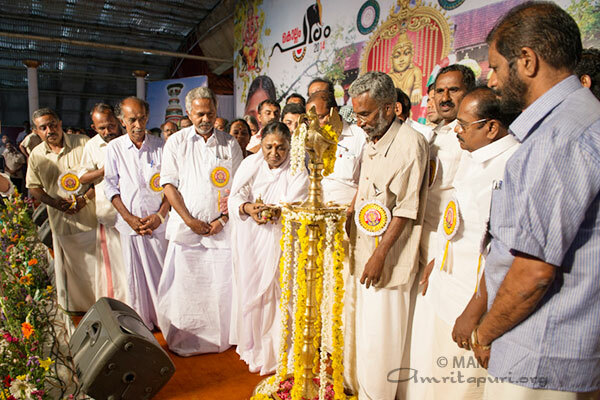 Amma was invited to light the lamp and inaugurate this year’s Kollam Pooram, a massive annual temple festival hosted by the Sree Krishna temple, Asramam. Attended by a large number of people, the festival is marked by delightful spectacles including elephants colourfully decorated with rapidly inter-changing ceremonial umbrellas (kudamattom), traditional drumbeats (melam) and pyrotechnics. 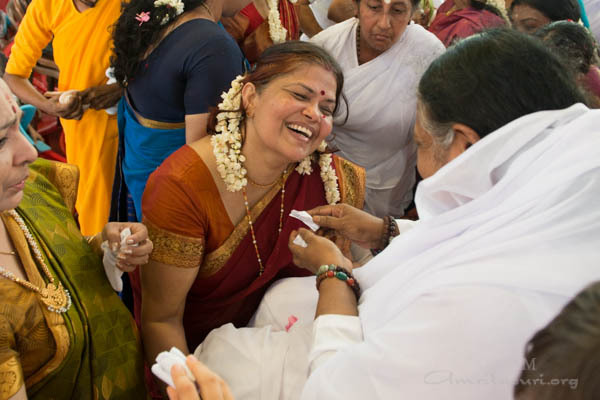 On her way to the festival, Amma visited the Sree Krishna temple proper and spent some time there. 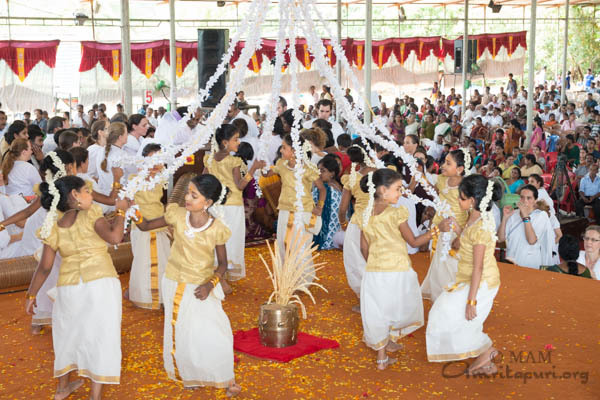 The festival itself is held at the Asramam Maidanam, one of the biggest festival grounds in Kerala. The massive crowd of festival participants was framed by 15 elephants in full regalia on either side, representing the nearby Ganesha and Devi temples. This is a historic occasion. 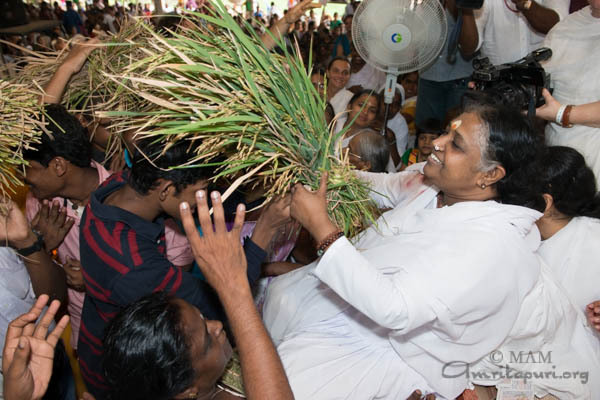 Amma is attending this kind of festival for the first time. 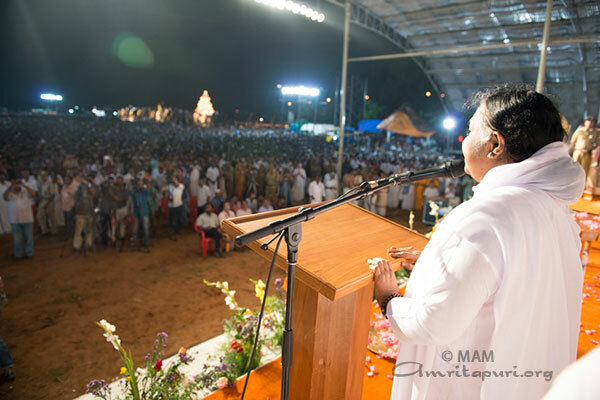 The people of Kollam and the festival organizers expressed their sincere gratitude for Amma’s presence, and their hope that with her blessings, the Pooram festival will become an international event for peace and harmony. Vishu is a festival that is deeply connected to our culture and to nature. When we hear the word Vishu, what first come to mind are images of the golden kanikkonna flower and vishukkani. 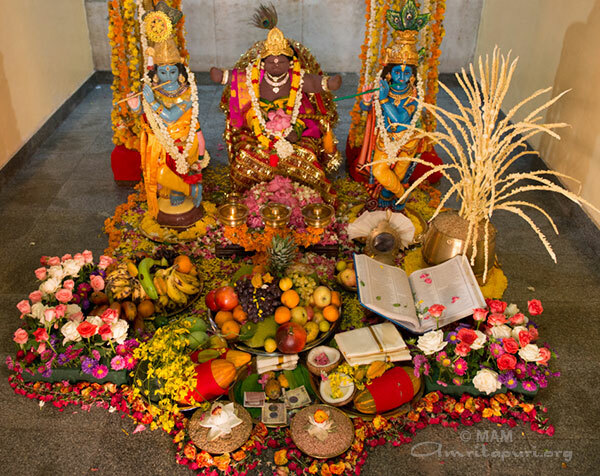 The importance placed on taking in the darshan (vision) of vishukkani—the traditional cornucopia of Vishu—upon waking Vishu morning symbolizes the importance of entering the new year seeing goodness and thinking good thoughts. 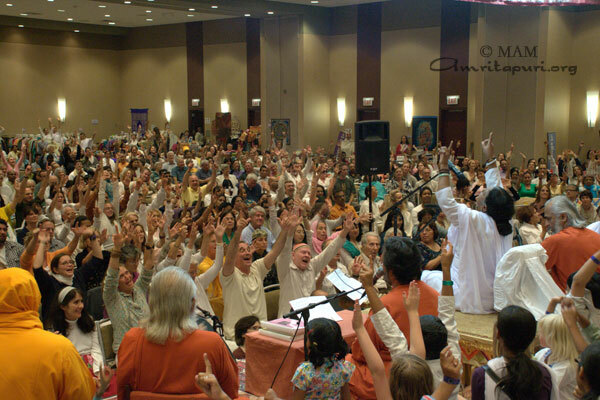 Whatever activity commences with the remembrance of God will be auspicious. Taking in vishukkani upon waking helps us begin the new year with the darshan of God and nature. The belief is that this auspicious vision will bear fruit that will stay with us throughout the year. Even in the drought and heat of the summer, nature is able to bring forth golden kannikonna flowers. This is nature’s teaching to us: Even in the midst of difficult times, happiness can be found. On Vishu morning, in every house, the mothers and grandmothers go to each room and wake up the children and other family members. They cover their eyes and lead them to the altar room. When everyone is standing before the image of the Lord, they remove their hands. The children open their eyes and behold the beautiful form of the Lord and the different facets of the vishukkani. Their hearts fill with devotion and enthusiasm. That is like a deposit that they then can draw upon throughout the year. Another meaning of the word Vishu is “being equal.” Vishu takes place when day and night have the same duration. Thus, it symbolizes how we should be able to accept both joyful and difficult circumstances with mental equanimity. Ordinary people become egoistic in success and lose strength when painful experiences occur. The reason we lose our mental strength is our failure to put God first in our life; these days, our first priority is the external. Life can bring us any kind of experience at any time. It can be criticism; it can be praise. It can be joyful circumstances; it can be sorrowful ones. It can be success; it can be failure. Anything can come at any moment. This is what life is. If we are to face these varied experiences with equanimity, then we should be prepared to give up our likes and dislikes. When difficult times come, some people take solace in thinking that they are reaping the fruit of selfish actions that they have performed in the past. This is a good attitude. Another practical approach is to accept all of our experiences as God’s prasad. To cultivate this attitude, we must first see all of our actions as offerings to God. When we surrender all of our actions to Him, we will then start being able to accept everything that comes to us in life as prasad in return. Then we will be able to see all experiences equally, transcending attachment and aversion. The greatest jail is our ego. Currently we are imprisoned in this self-created jail. A bird in a golden cage—provided with all types of food and toys—is still deprived of the all-expansive sky. Children, let us try to come out of this jail called the ego. Vishu is an occasion to remember how important it is to love and serve the Creator through the creation. My children, strive for this. We should also love nature. There is so much pollution in the atmosphere today. In the olden days, when someone had a wound, they would apply cow dung to it to help it heal more quickly. If we were to do this today, the wound would only become infected. What once was medicine has today become poison. Our air, our water, our food—everything has become polluted. When you chop down a tree without a true necessity, you are, in fact, building your own coffin. Let us use our time in a manner that is beneficial for ourselves and others. Let us try to do what we can. Let us reach out to nature and our fellow human beings. May we help make this world a tree full of flowers of happiness and fruits of peace. May every day in your life be filled with the joy and auspiciousness of Vishu. Children, when adharma is at its peak and dharma is disappearing, avataras take birth to uphold dharma. 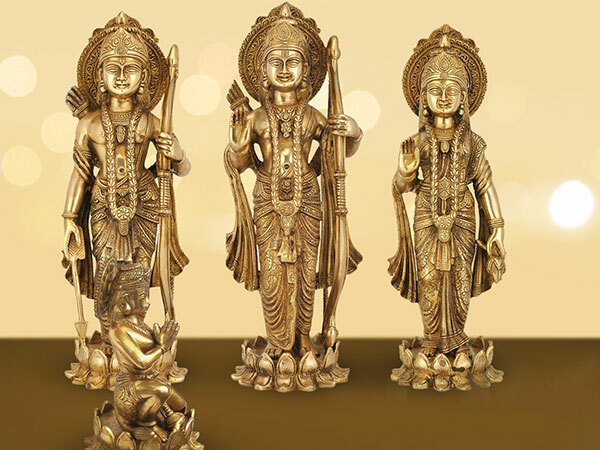 Thousands of years ago, Sri Rama, who was born on the ninth day of the month Chaitra, is believed to be dharma itself in a human form. Avataras teach humankind through the example of their life. Therefore, they will have limitations; they may have to pass through tests and obstacles, just like other people. Through this, they teach us not how to avoid problems, but how to safeguard our ideals and values when we find ourselves in the midst of problems. They show us how to face life’s tests with mental peace and equanimity. Through this, others find the inspiration to move forward along the path of dharma. Many ask, “If Rama was the all-knowing Lord, why did he chase after the golden deer? Didn’t he realize it was Mareecha’s illusion? It was because of this that Ravana was able to kidnap Seeta.” Understanding human nature, Sri Rama chose to take birth as a human being. Thus, like other humans, he displayed a mix of knowledge and ignorance, strength and weakness. Once a game begins, we cannot just change the rules in the middle. Like all humans, we can see joy, sorrow, hardships, problems and limitations in the lives of mahatmas. They behave like this so that others can come closer and establish relationships with them on a personal level. In truth, defeating adharma is not the foremost priority of avataras. 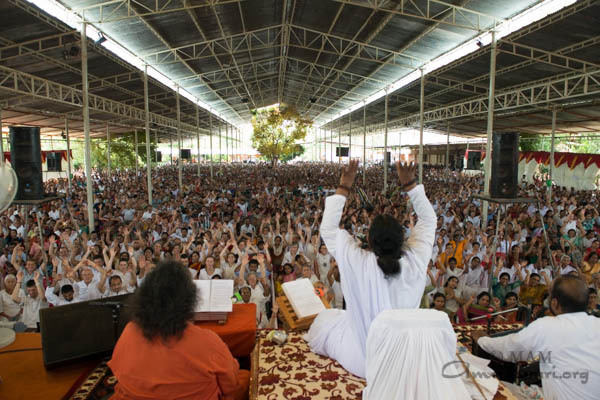 Their primary goal is to nurture devotion in the hearts of humankind. They attract people through their captivating leelas. Since our childhood, our life has been founded on relationships. Our first relationship was with our mother. Then with our father. Then with our siblings, friends, coworkers and acquaintances. Thus, for us, who are predisposed to forming such relationships, building a relationship with God and worshipping Him is natural. This is how Sri Rama and Sri Krishna earned their place in the hearts of humankind. Through them, a culture of devotion has grown in the world. There is a lesson for us to learn in how Sri Rama willingly faced every situation that arose in his life. How should an individual behave towards his parents, his siblings, his friends? How should a leader behave towards his followers? How to stand firm in the face of moral trials? All these can be learnt from the life of Sri Rama. Sri Rama did not become overjoyed when he learnt that he was to be crowned successor to the throne. Similarly, when he lost the throne, he did not fall into despair. Moreover, Sri Rama only had love and respect for Kaikeyi—the cause of his exile. Thus, Sri Rama is an excellent role model of dharma and values for us to emulate in life.